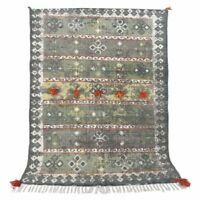 Hand-knotted Turkish 6'8" x 10'0" Color Transition Patch Wool Rug...DISCOUNTED! Hand-knotted Color Transition Patch Brown Wool Rug 6'8" x 9'11"
Hand-knotted Turkish 7'1" x 9'9" Color Transition Patch Wool Rug...DISCOUNTED! Hand-knotted Turkish 6'8" x 9'8" Vintage Anatolia Patch Wool Rug...DISCOUNTED! Hand-knotted Color Transition Patch Turquoise Wool Rug 6'11" x 9'9"
Hand-knotted Vintage Anatolia Patch Khaki Wool Rug 5'9" x 7'10"